Dhaka New Market, a unique shopping complex of the city with a long history, is located at Azimpur, with Mirpur Road on one side and Peelkhana Road on the other. 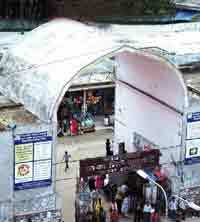 New Market area is triangular in shape with three high arched entry gates on its south, east and north sides leading to rows of shops. There are spaces for shops and a nice triangular lawn at the center and a mosque inside it with nice minaret. 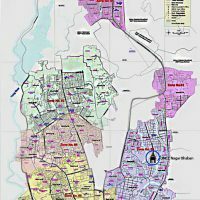 It was built in 50s as a shopping complex primarily to cater to the needs of the growing population of Dhaka city mainly in Azimpur Estate and Dhanmondi residential area. Eventually, it attracted shoppers from all other areas of the city and even from outside Dhaka. rovincial metropolis in 1905. Then in 1913 Yousuff Market was built in the Dhaka for the first time. Now there are 105 markets of Dhaka City Corporation, big and small, in the different parts of the city. Some are wholesale markets while some are retail markets. Among the DCC markets, New Market, Kawranbazar, Mohammadpur Krishi Market play a great role in the city. Every year, DCC develops and constructs many new shopping complexes for the city people. Chief Minister of East Pakistan. The market was completed in 1954. This heralded the beginning of a new era of development towards modernising Dhaka. Rickshaw ride or walking along the narrow lanes of old Dhaka for shopping was not a happy experience for families as old Dhaka was too conservative, noisy and crowded. Dhaka New Market is still today a large complex with variety of stores around and inside it. The three high arched gates lead to organized rows of shops for books and stationery, watches, clocks and spectacles, leather goods and travel kits, grocery items, clothes, jewellery, electrical equipment etc and a few service shops of tailoring, fast food, photography etc. There is a running covered veranda in front of the shops. The market has a total of 468 shops. Visitors can find most of their requirements in these shops and that’s why this is a favourite place to almost everybody who like to go for shopping. You may gain fantastic experience buying something from here. It is the only market where one can bargain and people of all income levels can find things of their choice here. Even the merchants may serve you tea or cold drinks while you shop and your children can play around. The unique feature of Dhaka New Market is shopping in open air and spacious atmosphere. Every shop is in the ground floor. In 50s and 60s, it was the most popular place for shopping as well as recreation. Young people, particularly college and university students in groups, donned in best attire, moved around in the evening for hours. Girls came in separate groups. For their, free-mixing with classmates especially boys outside was not permitted by the society. In 80s, three more blocks were constructed on the north under Dhaka City Corporation, e.g., New Super Market for crockeries, Bonolata for kitchen market, Chandrima for varieties of items and D-block for groceries, each having over 1000 shops. The nice green park inside now houses a mosque at first floor level with 62 new shops under it. The well-being of the merchants of Dhaka New Market is supervised by a bi-yearly elected committee comprised of 23 members called Dhaka New Market Byabosayee Samity. Many new large and ultra modern malls have sprung up in Dhaka, but the importance of New Market in Dhaka cannot be underestimated.